Jean Paul Samptutu has established himself as one of the most prominent African artists on the world stage. A winner of the prestigious Kora Award (the “African Grammy”) in 2003, Samputu travels the world as a cultural ambassador for Rwanda, bringing to his audiences not only traditional African singing, dancing and drumming, but also a message of peace and reconciliation. A survivor of the genocide in Rwanda, Samputu takes us to the most positive place of humanity through his sprit and graciousness. More than a talented and inspiring musician, Samputu is a model for anyone who wants to make a difference in this world today. 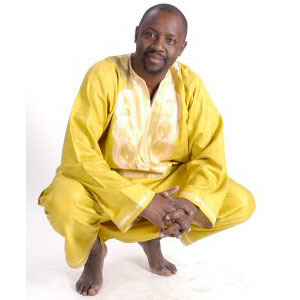 Born in Rwanda in 1962, Samputu began singing in 1977 in a church choir, and was influenced by tradition; and contemporary music, including Stevie Wonder, Bob Marley, Jimmy Cliff, and Lionel Richie. After winning the Kora Award for Best African Traditional Artist in 2003, he arrived in the US in 2004 for Ten Years Remembering, an event commemorating the 10th anniversary of the genocide in Rwanda. He continues his efforts to educate young people about genocide through panel discussions and forums at colleges and universities across the country. Samputu has been honored with the opportunity to share his message and his music at The National Civil Rights Museum for the 2005 Freedom Awards, where he performed in front of honorees Oprah Winfrey and Ruby Dee, as well as the ceremony’s host, Golden Globe Award winner Angela Bassett. He is one of only two Africa artists to perform for the World CultureOpen at the Lincoln Center in New York, and has also performed for UN High Commisioner for Refugees for World Refugees Day. OTher performances include Duke University, as part of Duke’s prestigious Performance Series, the Lake Eden Arts Festival (LEAF) in North Carolina, Pace University and Pace Law Schoolm and many other universities, churches, schools, and communities. Samputu sings in six languages and in styles ranging from soukous, and rhumba to traditional Rwandan ⅝, Afrobeat, pygmy, and gospel. With his dance troupe Ingeli, he captivated audiences of all ages. He has performed for the UN High Commissioner for Refugees, at the National Museum of Civil Rights Freedom Awards, and at many colleges, universities, festivals, churches, and communities around the world.